Kasco's new, revolutionary LED lights are the perfect addition to any fountain. Also, included are the additional colors of blue, amber, red, green and pink. Non-corrosive, 100% sealed fixtures reduce maintenance and leaking issues and the long-lasting LED's eliminate the need for bulb replacement. 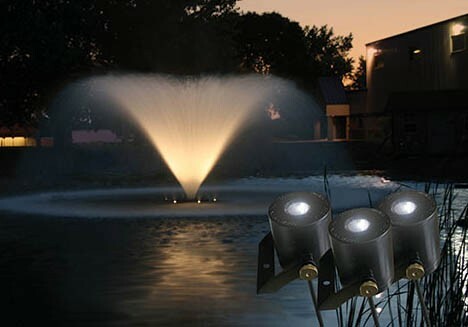 At only 9 watts per fixture, the power consumption is a fraction of other lights on the market. A sealed, waterproof splitter allows for quick and easy swap out of an entire fixture and stub cord in the field reducing any maintenance and/or repair costs. Perhaps the best feature of all is the price. Coming in at roughly 1/2 the cost of conventional lighting. The best return on investment option. 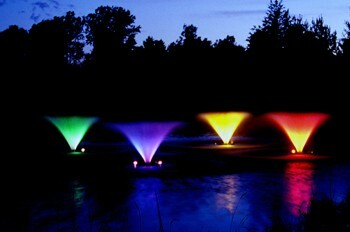 Includes: Everything you need to make your fountain come to life every evening. Need to know more > Downloadable Light Kit Manual.